Teachers: Print free teacher’s guides for the books below. They’re ABSOLUTELY, POSITIVELY JUST SO! Special thanks to Natalie Dias Lorenzi, who created the guides and is a fabulous children’s book author and teacher extraordinaire! I love school visits! Meeting my little readers is where the rubber meets the road for me as a writer. 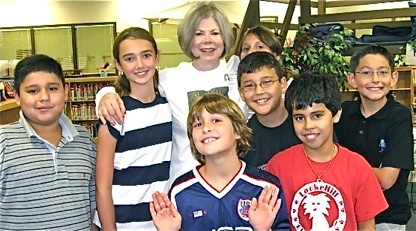 I tailor my presentations to second through fourth grades, but I can accommodate first and fifth graders as well. ● A reading from my second book “Maybelle at the Fair,” time permitting. I finish my sessions with 10 minutes or so of questions from the kids. Teachers work amazingly hard and school days are packed with “must covers,” but I strongly urge that students be exposed to at least one of my books before I arrive. It’s lots more fun that way. Kansas City area school visits are $500 a day. That includes four 45 minute presentations for groups of up to 200. Half days are $300 for two presentations. Out-of-town visits are $750 a day plus expenses. To cut costs for individual schools I will split days if travel times between schools are reasonable. I greatly appreciate payment on the day of my appearances. I’m honored to sign books, but my publisher’s contract prohibits me from selling them. Book sales will need to be handled through the school. For a book order form you can download, click here.